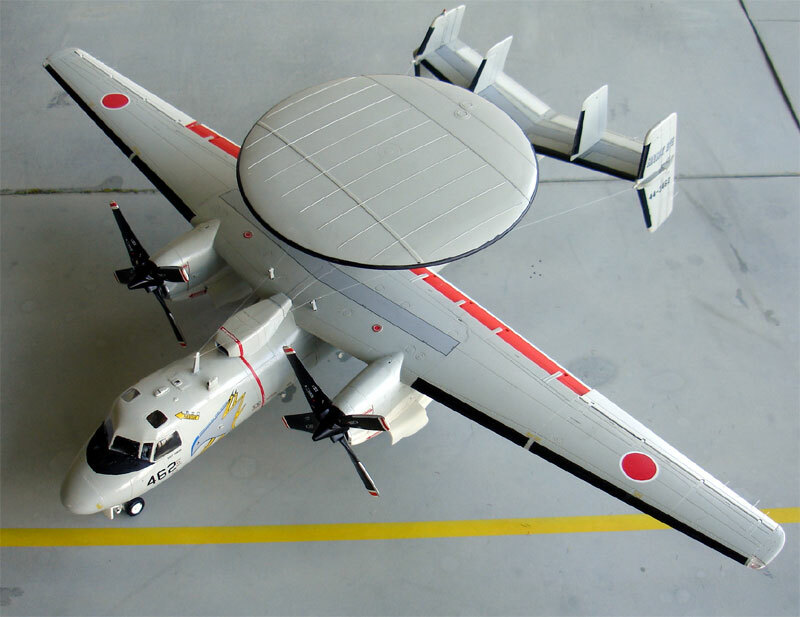 The Grumman E-2 was an aircraft designed and build for the Airborne Early Warning mission, protecting the fleet by signalling any upcoming threats. Evolving in the early sixties, the Hawkeye proved its worth. Obviously systems and radar were upgraded during its operational service life. 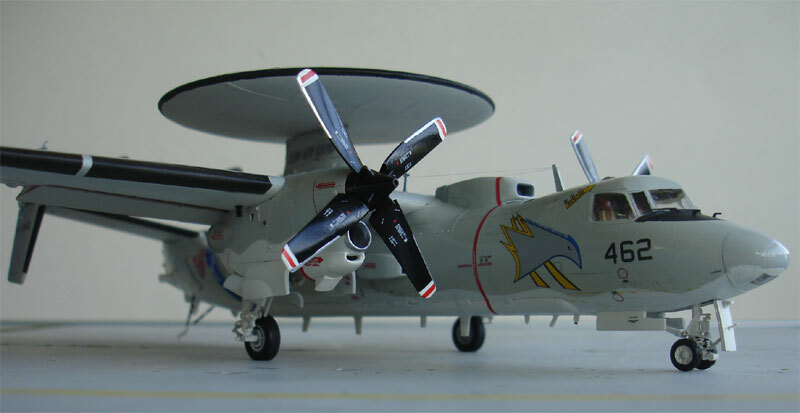 The first E-2C was an upgrade evolving in 1973 and the latest one is the Hawkeye 2000 with its new systems and better props as well. 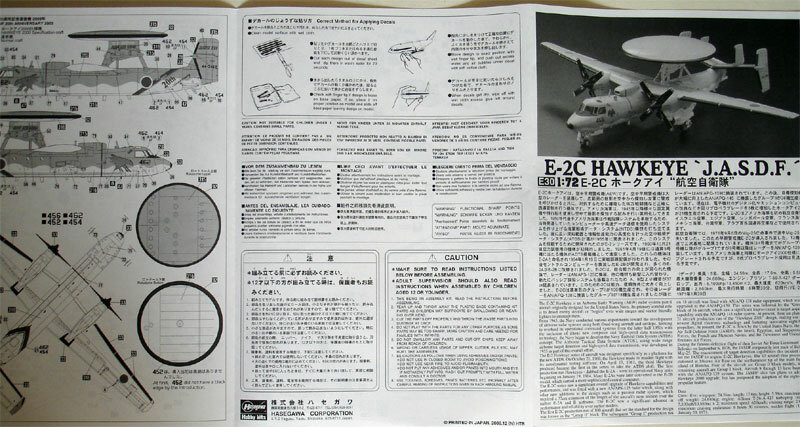 The Hasegawa kit in 1/72 scale appeared beginning 2009. 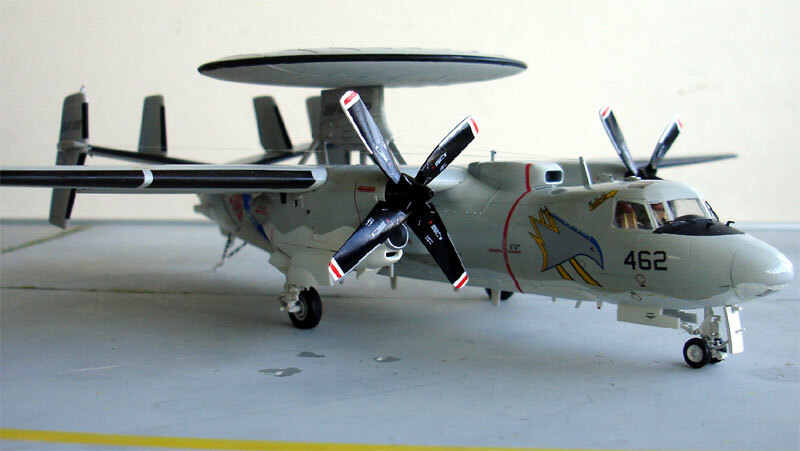 Thankfully Hasegawa issued this brand 1/72 new kit of the Grumman E-2C Hawkeye that immediately makes the old Fujimi kit useless. The new kit has very fine parts in light grey and accurate recessed panellines with raised details as well. You also get the option to lower the separate flaps. On the other hand there is no "folded wing" option as seen when Hawkeyes are on deck of US Navy carriers. So would you like to have this on your model, you need to do some work. The cutting lines are indicated on the kit parts to help with this. 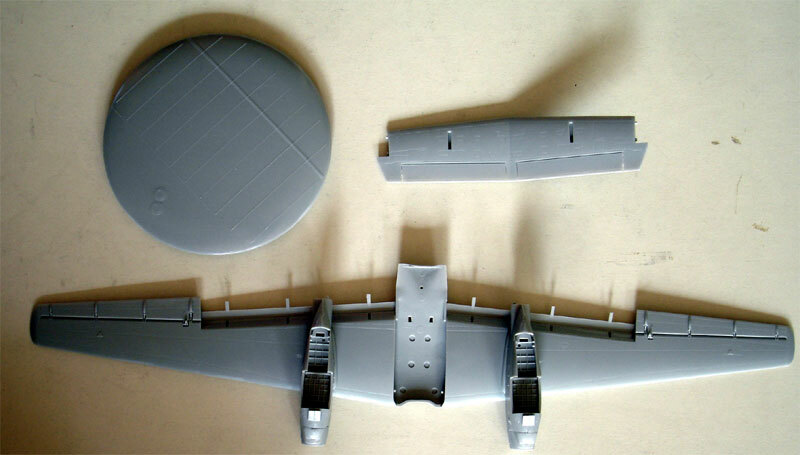 (I am sure a 3rd supplier will come with a conversion resin set for the wing fold mechanisms). The nose lights are catered for by a clear nose part. The parts are good with no sink marks and few ejector pin marks. Construction is fairly normal as might be expected. It looks like a Hawkeye and the kit seems accurate in dimensions. Some antenna's are optional, depending on the particular plane made. I purchased the Japanese Air Self Defense Force version of the kit with very nice markings for 4 JASDF planes with conventional gull grey/white schemes as familiar with the US Navy schemes. It has the usual old straight blade propellers. 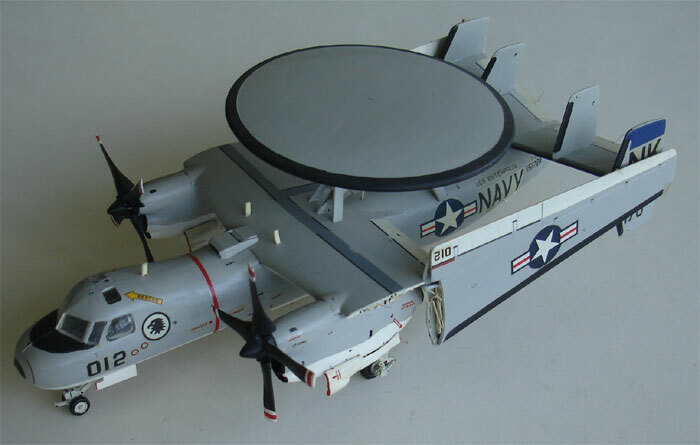 (Also a US Navy Hawkeye 2000 variant of this kit was issued, just one month later with the new swept 4 bladed propellers ). This is very nice to put this scheme onto this model. Parts fit is good, except for some filler for the belly part. This belly part is separate. 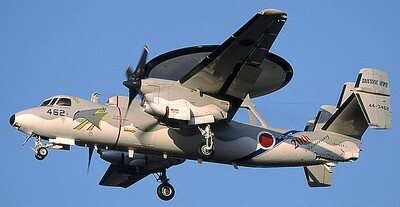 Maybe Hasegawa will issue other Hawkeye variants as well. The cockpit is simple with simple seats and also decals, but for this plane not a whole lot will be seen. The cockpit glass is provided in a single glass part that enables seamless integration with some very fine filling and sanding onto the fuselage. The engine nacelles fit OK, but need some minor filler as well. The sanding is a bit difficult because of the shape and curves. The engine intakes are a bit bare and would benefit if some internal ducting is made yourself. I did not bother and painted the intake area black, as well as the exhaust area. The topsurface of the main wing is one straight part which makes having a symmetrical result easy. The main wing assembly and tail assembly fit so good on the top of the fuselage, that I decided to airbrush the fuselage, wing and tail as separate assemblies. Make sure to include enough ballast, at least 40 grams. 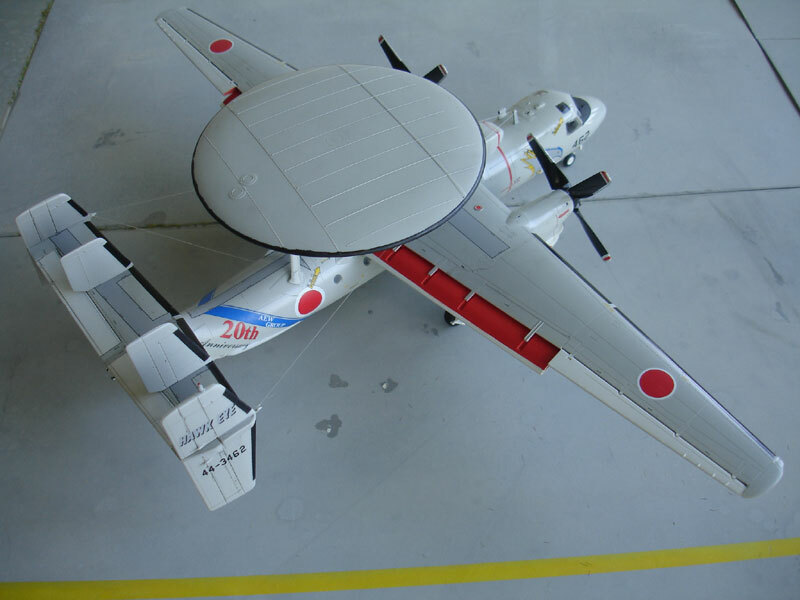 I added a lot, but is was still not enough as the radar dome that was fitted last again resulted in a tail sitter. 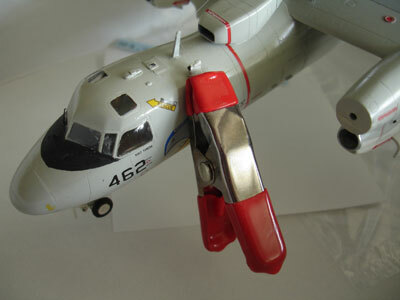 I will use the arrestor hook for balancing the model. Construction started with the cockpit area. I simply used the kit parts, painted the seat cushions orange and added some seat straps from tape. The decals were used for the instrument panels. The upper panel was also installed. The inner cockpit glass area where there are no windows on the plane was partly painted to "prevent" shine through later on. The fuselage went together OK, but the belly fairing needed filler and considerable sanding. 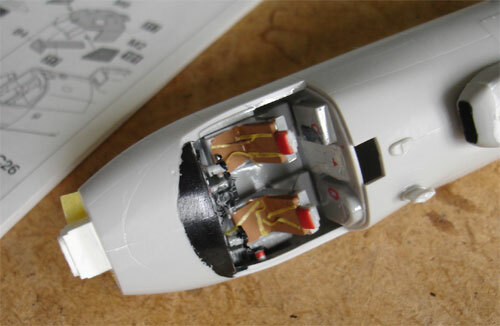 The wing was OK, but do not forget to open the appropriate holes for the required antennas and so on. 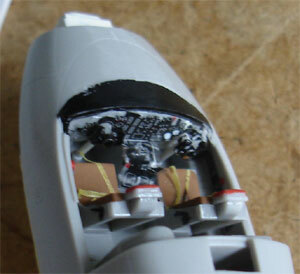 The wing tip lights are slightly to big, see need some sanding to reduce them in size. The undercarriage is very fine but all the time my wheels doors fell off. They need carefull glueing using their hinge stubs. The wheels tyres have flattened areas, which I do not like but seems not to bad. Overall, the model assembly was simple. 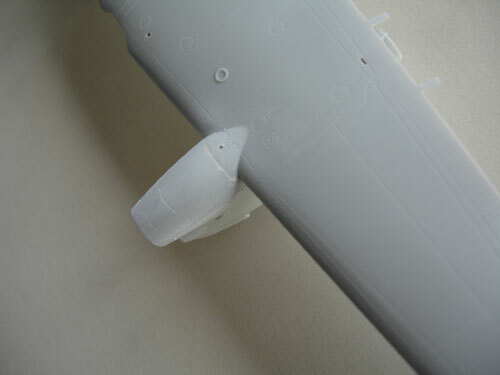 As noted, the fuselage, wing and tail assemblies were sprayed separately. Now, a lot of work is related to the black de-icing boots are the leading edges of wing, tail and stabilizers. This was done with Tamiya masking tape. A lot of work, but worth the effort. Many radar domes on Hawkeyes also have black edges (but not always). 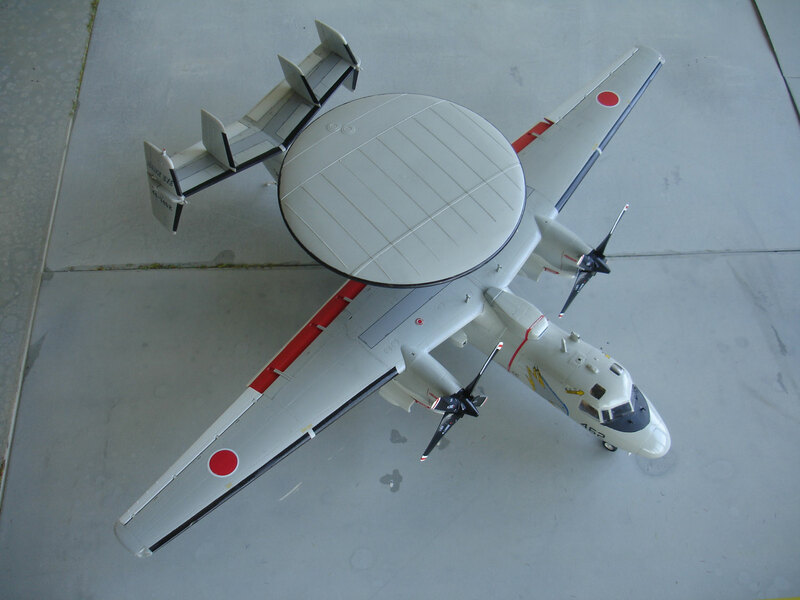 My particular JASDF plane had this, so the edge was handpainted with a brush in black. The propellers were sprayed black with metail edges handpainted. The white tips were painted as well, although also propwarning stripe decals are being supplied. I opted to paint the prop tips white-red-white with a brush which is easier. As usual, propellers take time to finish. 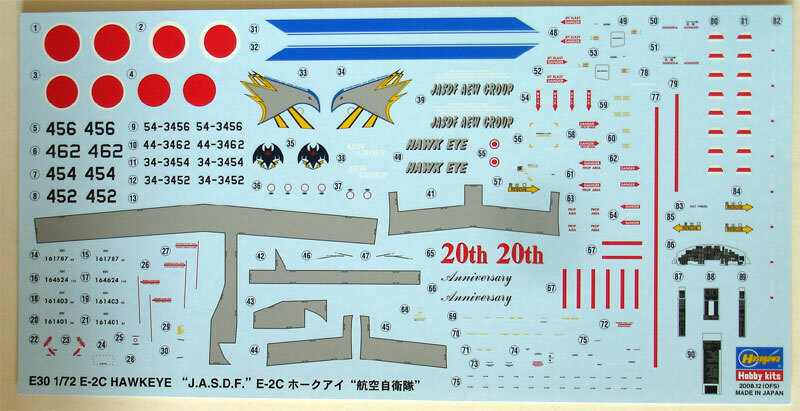 The JASDF Hasegawa kit decals are very thin and fine. I even opted to add these while the main assemblies were not yet merged. This made application much easier with good handling. Decals of the aniversary plane went on well, with the blue band. The various walkway lines are commendably thin, a lot of the work to apply with the "no steps" but the result is a spectacular finish. After decal completion, the overall model was cleaned up a bit and given a protective gloss coat of Johnson Future/Pledge again. JASDF planes are really glossy and well maintained. Final touches were adding a few static dischargers from fishing line at flying surface outboard tips and thinner windscreen wipers. Two small pitots in front of the windscreen completed the model. A nice result and a build that should give no problem at all for the average modeller.